POM Incorporated (POM), based in Russellville, Arkansas, is a Juniper Systems partner with a long history and an interesting use of the Archer 2™. POM is a direct descendant of the first parking meter company, Magee-Hale Park-O-Meter, established in 1935, making POM the oldest and one of the largest parking meter facilities in the world. In fact, “Park-O-Meter” is where POM got its name. POM also carries the Archer 2 to be used in conjunction with its parking meters. Specifically, POM customers use the Archer 2 to run the POMComm parking meter management app, which integrates with POM’s cloud-based software, MeterManager.Net. 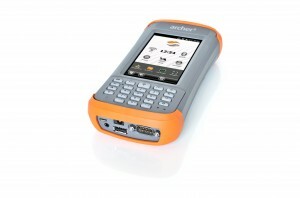 The Archer 2 provides the unwavering reliability, ultra-ruggedness, excellent display visibility, and superb battery power that POM’s customers need from a handheld computer. Recently, POM released its newest parking meter, the Parktel 2.0, which offers easy installation, innovative technology, and power conservation. The new meter simply “drops in” to most existing parking meter housings and features a rather large, 4.4-inch reflective display, for easier viewing. The display also happens to be a “memory LCD,” which allows it to display a static image, without drawing any power from the battery. The parking meter has a really useful power-conserving feature too, in addition to a solar-charging battery pack. Typically, all connected parking meters rely exclusively on individual, power-draining cellular modems. But POM has developed a patent-pending “dual-mode connectivity interface,” which allows parking meters to sort of, “share” power. So although each meter still retains a cellular modem, only one meter’s modem is used at any one time, providing power to the entire network of parking meters. The other parking meters transfer information to this “gateway” meter using low-power ISM radios. The gateway meter then pushes all of the collective information from the meters to MeterManager.Net and/or a credit card gateway provider. Each day, another meter takes a turn at acting as the gateway meter, so as to diffuse the power load on the entire system. 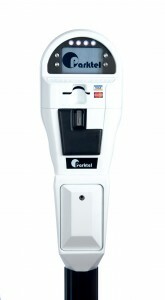 The Parktel 2.0 can monitor from one to four parking spaces, and can be configured to accept coins, credit cards, chip cards, and contactless (NFC) payment sources. POM has even developed a feature that provides a refund for unused parking time (how many dimes could I have saved on that?!). Using the Archer 2 with the POMComm parking meter management app, POM customers can collect, and then send data to POM’s cloud-based MeterManager.Net. On MeterManager.Net, users can configure meter settings, including dynamic rate changes, custom displays, and individual LED and button functions. They can also specify alerts, check meter status, and run revenue reports. We thought this was a unique and interesting use of the Archer 2. Do you have an interesting use of a Juniper Systems handheld? Share with us in the comments below. To learn more about this and other applications of Juniper Systems’ handhelds, please contact us online or by phone at 435.753.1881.